Nobody knows what is there in the film. Without the certificate of the censor board, no one can even release the trailer and we are seeing protests demanding a ban on the film, Yechury said. 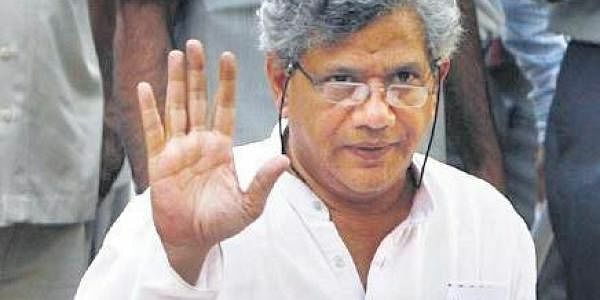 A file photo of CPI (M) general secretary Sitaram Yechury. KOLKATA: CPI(M) general secretary Sitaram Yechury today came out in defence of upcoming Bollywood film "Padamavati" and said the protests against the film, before watching it, were a "sign of intolerance" in the country. The controversial film, directed by Sanjay Leela Bhansali, is scheduled to be released on December 1. "It is shameful that we are witnessing protests over a film. Nobody knows what is there in the film. Without the certificate of the censor board, no one can even release the trailer and we are seeing protests demanding a ban on the film," the Left leader said at a programme here. "The protesters are demanding that the film should banned. Who are they to decide what is history and what is not? This is a sign of intolerance," he added. Yechury likened the protesters to the private armies of Adolf Hitler and Benito Mussolini. "The way Hitler and Mussolini had engaged their private armies of black shirts and brown shirts, these private armies (protesters) are functioning in the same way," he said. Stating that the country was witnessing "moral policing", the Left leader said, "The people of this country are being dictated as regards what they should eat, what they should wear. Who are these gau rakshaks (cow vigilantes)? They are killing people and the police are filing cases against those who are being attacked. This is nothing but signs of fascism through communal polarisation." He also criticised the protesters for threatening Bollywood star Deepika Padukone, who has essayed the lead role in "Padmavati". "They (protesters) are saying that they will chop off the nose of Deepika Padukone. I know her father, a famous badminton player who had brought more laurels and honours to the country than these protesters who are ransacking cinema halls, demanding that the film be banned," Yechury said. The controversy surrounding "Padmavati" took an ugly turn yesterday as a leader of the Shri Rajput Karni Sena cited the nose-chopping incident of Surpanakha in the Ramayana and warned Deepika against "inciting" sentiments. Another Rajput outfit, the Rajput Shaurya Foundation, had yesterday alleged in Lucknow that an attempt was made to distort history in the film and said they would not allow its screening. Protests against the film were also held in Patna among other places. Rajput groups had staged protests in Gujarat and Bengaluru as well.